When you’re getting ready to dig, the soil should be neither too wet nor too dry: a handful squeezed in your fist should form a ball that crumbles apart, yet still feels moist. If you dig into soil that’s too wet, you’ll compact it (making it difficult for air to penetrate throughout the soil once it dries) and destroy beneficial microorganisms. You can’t work amendments evenly into wet soil, either. Garden beds are of two basic types. Some are dug directly in the ground, while others (raised beds) are located in frames that sit on the soil surface. 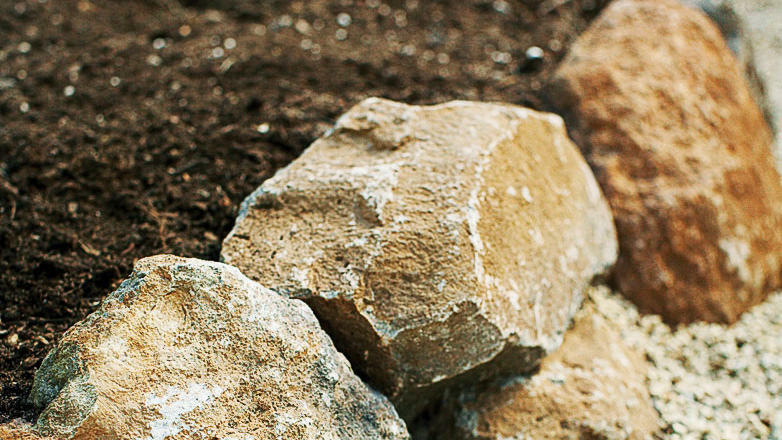 When making new in-ground beds, some gardeners always raise them, even if just by a few inches, using decorative stones, bricks, or bender board as an edging. They’ll tell you that by time they amend the bed’s soil, it’s “fluffed up” higher than its original boundaries anyway. The raised soil gives plant roots a few more inches of growing room, and the edging keeps the soil in place. Other gardeners make mounds as they dig. In this case, the bed’s edges are close to the original soil surface, while the center is elevated; plants can grow both on top of the mound and on its sides. You may want to create several mounds, adding large decorative stones for accents; in this case, the mounding forms part of the landscaping. As is true for the slightly raised beds just described, the mounded soil ensures plenty of depth for root growth as well as excellent drainage. In the vegetable garden, such mounds are convenient for scrambling, vining plants such as melons and squash. You’ll also see various types of raised or mounded rows in vegetable gardens; in most, the seedlings are planted at the top to maximize root growth and drainage. When you dig, start by clearing most of the debris from the soil. Then use a sharp, square-bladed spade or a spading fork to break up the soil to a spade’s depth–typically 8 to 12 inches. Don’t turn each spadeful completely over; if you do, roots and debris remaining on the soil surface may form a one-spade-deep barrier that cuts off air and water. Instead, turn the loosened spadefuls of soil only onto their sides. Once you’ve broken up the soil, change to a round-point shovel for mixing in amendments and evening the surface. If you’re digging a large bed, consider using a power-driven rototiller. If the soil hasn’t been worked in a long time, go over it first with the blades set to a shallow level. Spread amendments over the surface, then rototill again with the blades set deeper into the soil. Once a bed is ready for planting, don’t walk on it. Following this rule will be simpler if you can easily reach all parts of the bed from its borders; if it must be wider, add board paths or stepping-stones to control foot traffic. Raised beds have many advantages. Their soil warms earlier in the spring and drains well; and because it’s usually free from foot traffic, it remains loose and easy for roots, air, and water to penetrate. Orient raised beds in an east-west direction so they’ll receive as much sun as possible. Construct them of wood, cinder blocks, or other materials at least 2 inches thick, and make them 3½ to 4 feet wide; you should easily be able to reach the center of each bed from its edges. The bed’s height depends on several factors. If the existing soil is healthy, the bed need be no higher than 8 to 12 inches; deep-rooted plants will grow down into the native soil. If the existing soil is poor, however, you’ll probably want to make the bed higher to give roots more room. The maximum height is usually about 1½ feet. Fill the bed with well-amended soil; you can use soil from another part of the garden or purchased topsoil. Amendments should include well-rotted manure and compost or soil conditioner. The soil surface should be 2 to 4 inches below the rim of the completed bed.